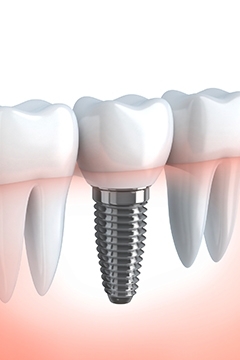 Dental Implants are the best way to replace missing or damaged teeth. 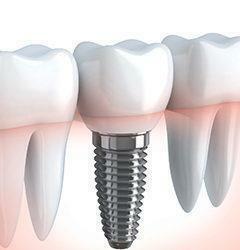 A dental implant is a replacement for your own tooth root, made from titanium and fitted precisely into your jawbone. It is inserted under local anaesthetic by one of our Oral Surgeon specialists, where it fuses over time with your own bone in a process known as osseointegration. This process takes between three to six months but will vary from patient to patient. Once the dental implant – the replacement ‘root’ – has fused to the jaw, you may add a crown, a dental bridge, or full dentures atop a single dental implant or multiple dental implants. The secure implant will allow any prosthetic teeth to look, feel and function like natural teeth. 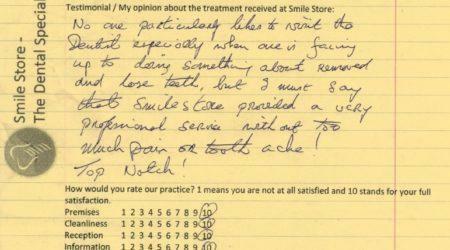 Why get my dental implants fitted at Smile Store? Who can benefit from Dental Implants? Why are Missing Teeth a Problem? How Do Dental Implants Help? Dental implants avoid bone loss problems caused by full and partial dentures. One of the benefits of a dental implant over a bridge is that the neighbouring teeth are not affected. 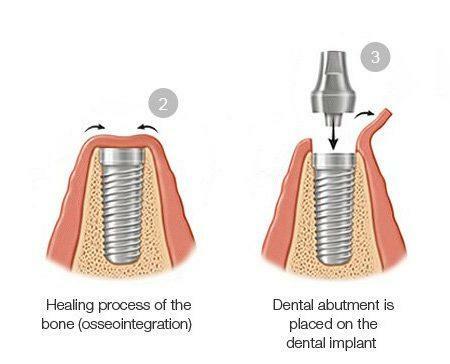 A single implant is inserted in about 15 minutes and the surgery absolutely is pain-free. Dental implants are replacing missing teeth roots and can also bridge a longer gap. A very good professional job. Nice and pleasant staff. A great service. I feel very relaxed coming here. Excellent experience overall. 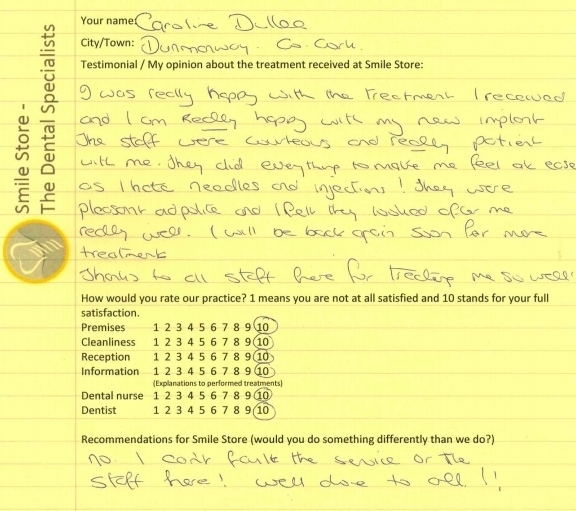 Everyone from Receptionists to Specialists were extremely professional, pleasant and reassuring. I would highly recommend this service. Very professional, great attention to details, patience and understanding. From the first appointment I was treated with a warm smile at reception and informed of everything I needed to know step by step. I would highly recommend Smile Store. They go beyond to make sure your experience and you are comfortable during procedures. Amazing dentists. All staff are friendly and take an interest in who you are as a person. Good experience. 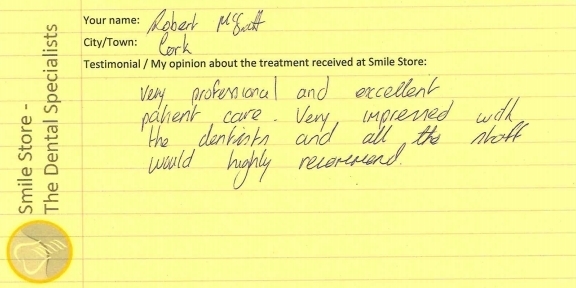 I can’t say enough good things about Smile Store Clinic. Thank you. Very good – excellent staff. Very good value for money. Would recommend Smile Store. I had a fantastic treatment. I was always taken on time and was also told beforehand how long each appointment would be. Honestly I can’t understand how smoothly the place runs. Fantastic place, very very clean and always lovely smiley staff. Everyone at Smile Store is curteous and professional. All appointments were timely and easy to organise. The treatment itself was top class. Delighted with the result!! Treatment at Smile Store is delivered in a very professional manner, and in a way that inspires the utmost confidence in the competency of the staff. 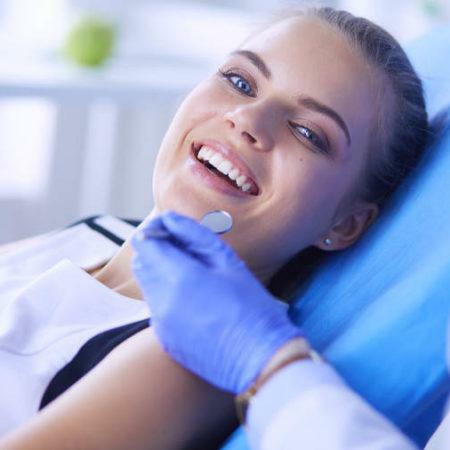 There is a very high level of coordination among staff, resulting in all aspects, especially the important details of the treatment, being delivered very efficiently and competently. I’ve been using Smile Store for the past 6/7 years and their work and professionalism is outstanding. I would highly recommend them. As of now, absolutely satisfied with the procedures I’ve had in the clinic. Professional and pleasant staff. Would definitely recommend to others. I am very happy with my treatment results. 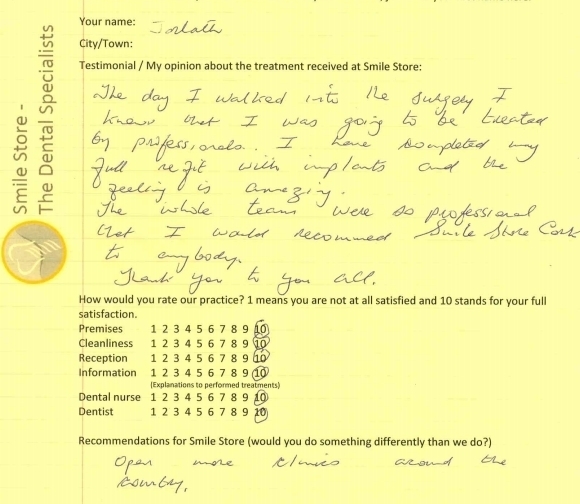 The staff and dentists were very helpful and friendly and always there when I had a problem or enquiry. 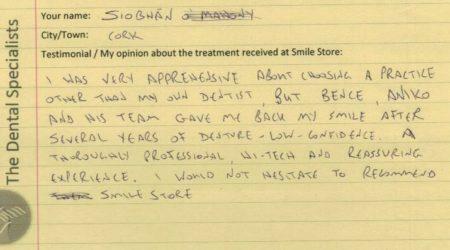 The treatment I received at Smile Store was excellent. My experience from start to finish was so positive. I was taken through the dental plan & each individual step was explained to me at each juncture. Smile Store was recommended to me by a friend whose husband had extensive treatment. Initially when I researched the matter myself I thought that it would be far more expensive. My dentist had recommended that I get an implant, however he was recommending a place that costs approximately €3,000 for one implant&crown. In the course of my treatment I got fillings on my front teeth. I cannot tell by locating at them which teeth actually have fillings, due to the quality of the dental work. I have completed my treatment and have had five front teeth filled as well as an implant & a crown for significantly less than the cost of the implant & crown that my dentist was recommending. This is an investment for my future. I arrived at Smile Store after two attempts of bone graft to receive an implant and the doctors & staff were very kind in receiving my case. 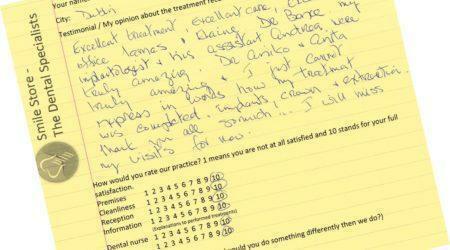 Throughout the process the practice showed remarkable attitude, empathy and professional care. At the end of my journey I am very happy with having to choose Smile Store as my trusty dentist. Thank you! I was really happy with the treatment I received and I am really happy with my new implant. The staff were courteous and really patient with me. They did everything to make me feel at ease as I hate needles and injections! They were pleasant and polite and I felt they looked after me really well. I will be back again soon for more treatment. Thanks to all staff here for treating me so well! Well done to all!! Very professional, always felt at ease. Happy with every visit I made there. Very happy with final result. Plus now I can smile again. Thank you. I received an excellent service. The detail about what I would experience at each section of my particular job was clear. Appointments were on time. The friendliness and professionalism was excellent. Love all my new teeth! I find all the staff here excellent to deal with. Efficient, pleasant & brilliant @ their jobs! I am very happy with the treatment at Smile Store. Staff and dentists are all very friendly and professional. I was well informed and treatment was adjusted according to my wishes and needs. I was also contented with being reminded beforehand of every appointment. All my treatments here have been outstanding. Very professional and excellent patient care. Very impressed with the dentists and all the staff. Would highly recommend. 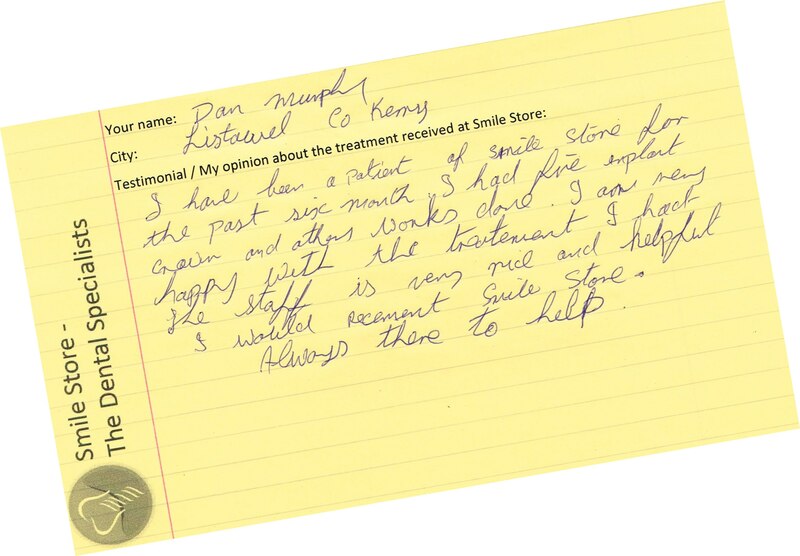 My teeth were destroyed before I came here, and now thanks to all of ye here at Smile Store I can smile again. I’m a very nervous patient and all the dentists made me feel so comfortable and relaxed. Thank you to everyone at Smile Store Dentist. I have nothing but praise for this practice. I cannot find a fault. Thank you to all staff for taking such good care of me. The staff are courteous and polite. The treatment involving anaesthetic always seemed appropriate to the task at hand and I felt I was in good hands, at no time in pain, in spite of my own not uncommon anxiety around going to the dentist. I have beed educated through the course of my treatment with regard to the ongoing care of my teeth and dental hygiene. The reason I came here in the first place was economical but I stayed for the firm but compassionate professionalism. The treatment I have received is first class from start to finish. The staff are very nice and would recommend Smile Store to anyone. From start to finish the process was very open and informative. 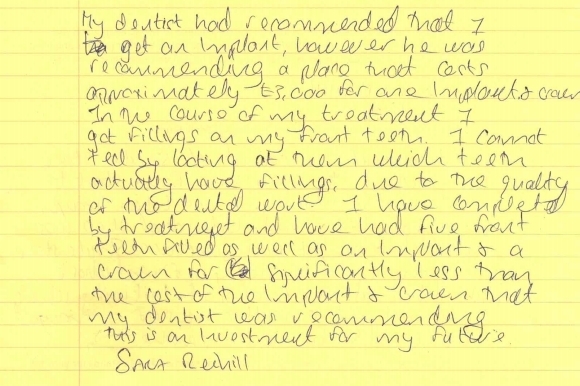 Whenever you start anything like having implants put in, you find hidden costs. That was not the case with my experience with Smile Store. I am very happy with my treatment. 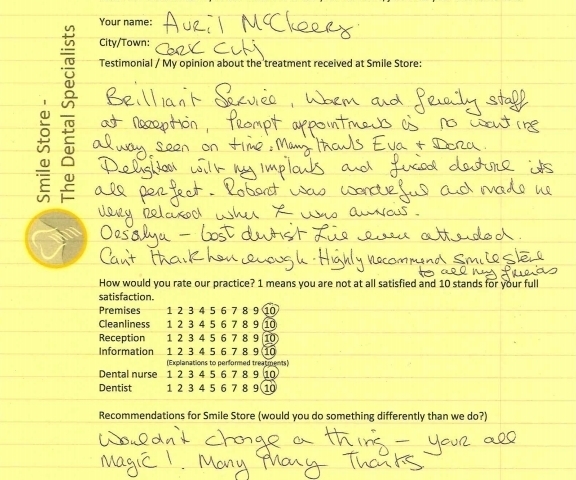 Staff were always very pleasant and informative and I am very happy with the end result. Was second to none, top class treatment. Staff explained everything in detail for every treatment and was very comfortable during all treatments. Everything went smoothly and I was given sufficient time between treatments to think and reflect on how I wanted to continue. Payment and treatment planned and broken down well. Very professional. Very happy with overall treatment. Can smile again with confidence. Very happy with my implants. Bence, implant surgeon put me very much at ease and lovely personality + very professional. Very happy with treatment. Receptionists are lovely to deal with. The day I walked into the surgery I knew that I was going to be treated by professionals. I have completed my full refit with implants and the feeling is amazing. 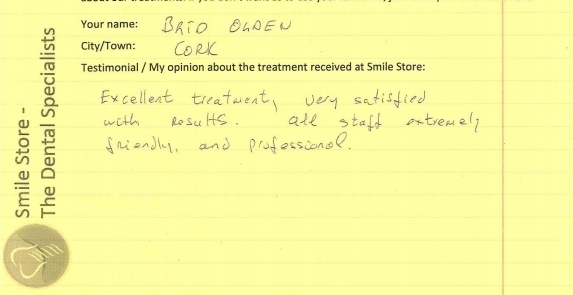 The whole team were so professional that I would recommend Smile Store Cork to anybody. Thank you to you all. Open more clinics around the country. I am really happy with the outcome of the work carried out on my teeth by Smile Store. They are friendly and extremely professional. I dreaded getting an implant done but felt nothing and the result is amazing. I have had an implant and root canal treatment with crowns here at Smile Store. The treatment I received is ” gold standard”. Clinical excellence, up-to-date diagnostic imaging, excellent and kind patient care, speedy and immediate follow-up with any queries after treatments. 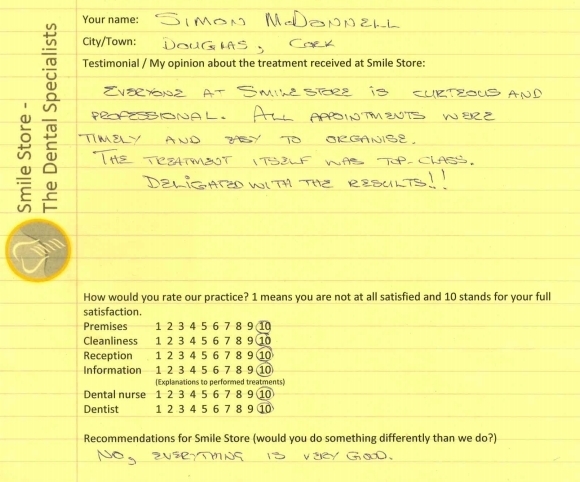 Smile Store provides a cost effective, high quality service. Excellent Dentistry! The whole process has been easy, efficient and professional. I have had no problems and I have never dreaded my appointments. Everything is explained very clearly and I have always been aware of what was being done. The exceptional work is amazing value and I would definitely recommend it to anyone. Very thorough treatment, good care taken to explain procedures to me in advance. Excellent treatment, all steps explained in detail. Professional and friendly. Excellent. Efficient and courteous. Very accommodating with dates and times. Staff very friendly. Dental team explained procedures etc. very clearly. Had quite a few visits, needed two crowns, and each visit was a pleasant experience. Delighted with the end result. Would highly recommend my family and friends to use the Smile Store! Brilliant service. Warm and friendly staff at reception. Prompt appointments is no wanting, always seen on time. Many thanks Eva + Dora. Delighted with my implants and fixed denture, it’s all perfect. Robert was wonderful and made me very relaxed when I was anxious. Orsolya – best dentist I’ve ever attended. Can’t thank you enough. Highly recommend Smile Store to all my friends. Wouldn’t change a thing – you’re all magic. Many many thanks. The treatment received was very efficient by all involved. Very timely / helpful and I am very happy to reach the end with much success. Treatment has been excellent and professional from beginning to end. Would highly recommend Smile Store. 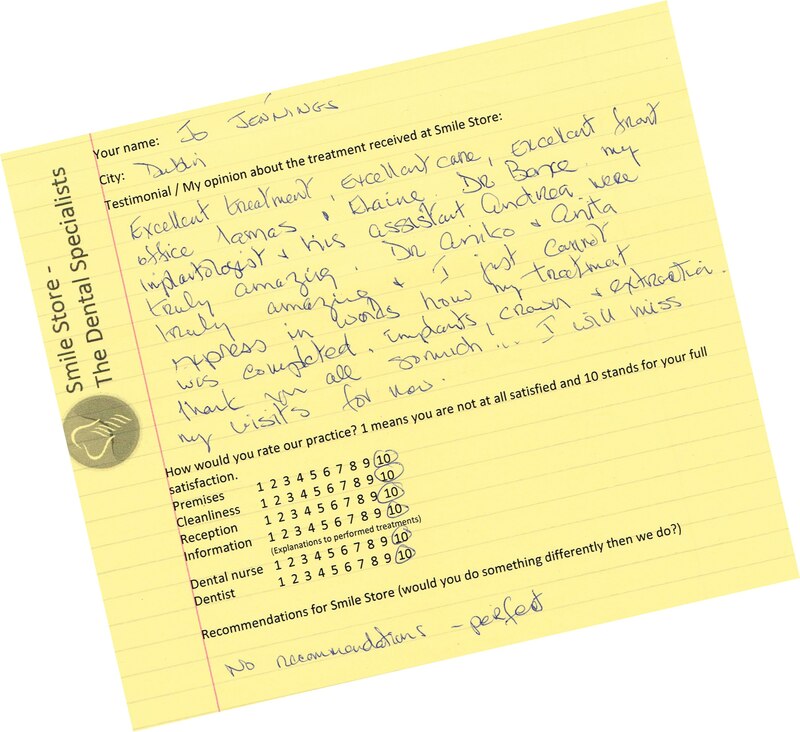 Was very pleased with the professional attitude of all aspects of my treatment and would recommend Smile Store to anyone needing professional dentistry. The staff at Smile Store will make you feel at ease from the moment you walk through the door. All procedures are well explained and with minimal discomfort. And the end of it you will have a fantastic smile and fantastic value. Hi I had my implants fitted today, can’t describe the feeling of being able to smile freely. I was so aware of the gap in my teeth and the dentures were so uncomfortable, so last October I found smile store on a search of the internet, from the moment I contacted them it was a seamless procedure. All my appointments were on time the staff were friendly efficient and Dr Robert Nagy is a true gentleman. 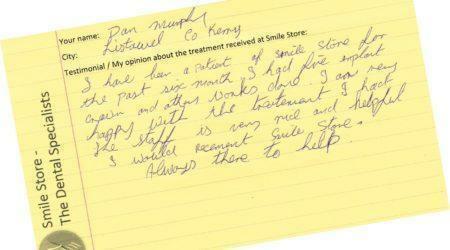 A very nervous patient, I have always hated visiting the dentist, so The Smile Store was a breath of fresh air. I had a full implant and periodontal cleaning and I have to say I am delighted and surprised with the final result. No more bleeding gums and no more false teeth. I am absolutely thrilled with the results. I cannot praise The Smile Store enough, brilliant service and very professional with incredibly low prices. Thank you or giving me a reason to smile again. I am very happy with all the treatment I received. I’m delighted with my new implants. First class treatment – truly professional from start to finish. All staff friendly and accommodating in every possible way. My treatment was top class. Great staff and happy with my final results. Excellent treatment, really happy with end results. Staff very friendly as well. Doubtful at the start, but would recommend it 100%. Excellent treatment, very satisfied with results. All staff extremely friendly and professional. 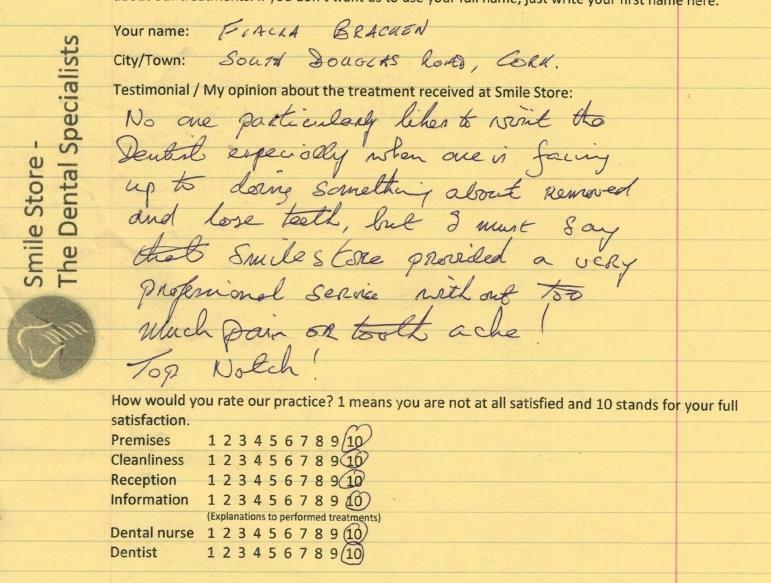 Hi, I’ve had a huge amount of work done here, everyone here were amazing, they never judged me they were just so helpful from reception to the chair, special mention for Aniko she is amazing it was important to me to feel comfortable and trust my dentist. Aniko is a genius at what she does and the rest of the team. I was given different treatment plan options to choose from, complete with explanations and prices. On an ongoing basis the treatment was explained in words and on the computer screen and questions regarding treatment were welcomed and answered. I could not fault the treatment itself & dentist and dental nurses seamed considerate & efficient, and I am pleased with the result. You cannot buy a smile.But they are professional AND make you smile.And then your smile looks better. Totally professional in every aspect. From the moment you walk in the door, every aspect of the Smile Store is exceptional. I started with a consultation, everything was explained to me with several options offered. After choosing the Straumann implants, everuthing went according to plan. The quotation was broken down with various payments over the time of the treatment. It cost exactly what was quoted day one, not a penny more. The visits were scheduled and on time every time. 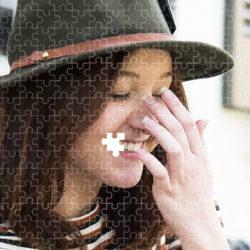 The team were amazing and the finish product – “The Smile” – PERFECT. 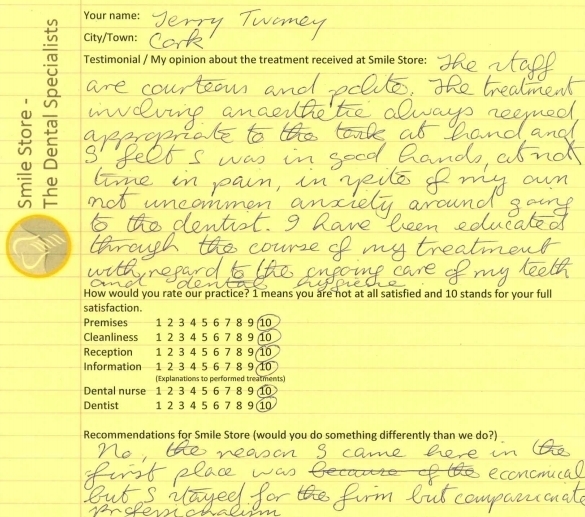 It’s an absolute pleasure to recommend The Smile Store. “I recently finished treatment which was carried out over a 5 month period and included implants, a crown and some root canals. I was prompted to check out Smile Store after paying 900 euro to local practitioner for a root canal treatment, he asked me for 970 and agreed to take 900 after a little negotiation. The comparable root canal at Smile Store (yes it was at the back) cost me 365. I was also quoted over twice what I paid Smile Store for implants by local guy. ” Wanted to let you all know how delighted I am with my first completed implants. I was like a child waiting for Santa and I was not disappointed yesterday! Dr. Bence’s wonderful work as my Implantologist came to fruition. Part one was completed yesterday July 4th 2013 by Dr. Aniko and her assistant Anita. Excellent treatment, excellent care, excellent front office with Tamas & Elaine. Dr Bence, my implantologist & his assistant were truly amazing. Dr Aniko truly amazing and I just can not impress in words how my treatment was completed. Implants, crown & extraction. Thank you all so much! I will miss my visits for now. “Very impressed with the professional approach of all staff. Had my first implant surgery recently as was given every explanation and time needed to deal with the issues arising by Dr. Bence Kadar. I look forward to having all treatment completed by year end”. 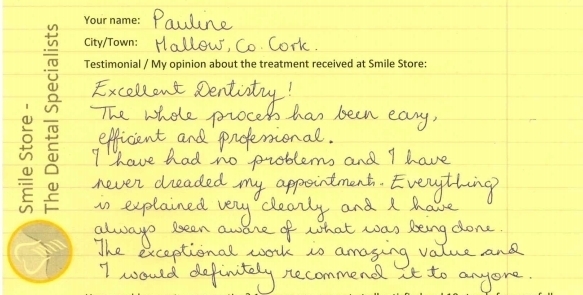 “The treatment I received was excellent. The staff are friendly and helpful in all ways. […] you have everything down to a fine art. Bacteria living on your Tongue: How to Get Rid!